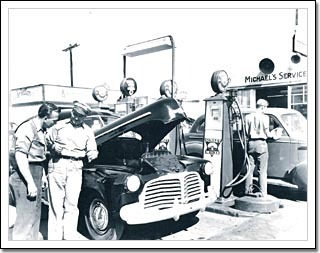 Michael A. Slama, Inc. is a manufacturer in Portland, Oregon USA, specializing in reproductions of gasoline and oil logos used from the 1920’s to the 1940’s. We manufacture high quality reproductions of the colorful advertising globes and decals used on antique gas pumps. Our goal is to provide collectors and restorers of vintage gas pumps with the most accurate and the highest quality globes and decals. Most of the processes and materials used are virtually unchanged from those of the original manufacturers. We put much time and effort into our products to achieve this. In creating these products, we hope to promote appreciation and preservation of the golden age of the American service station. The use of our globes and decals will give your restored pump a definite ‘look’ that feels like you’ve stepped back in time! In the future, we plan to add more colorful and graphic logos to our line, including many from other areas of the country. Just Added: 15" GAS PUMP GLOBE BODIES Our own high quality steel bodies in two profile styles! Our colorful AD GLASS is the perfect touch for your gas pump restoration! When Mike Slama began restoring vintage gas pumps in the late 1980's, only a limited number of globes and decals were available to restorers. As Mike's interest moved more to the beautiful art deco and 'streamline modern' styles popular in the 1930's, he began looking for accurate globes and decals to use in his restorations. The cost of locating and using original globes was prohibitive, and finding usable original decals was virtually impossible! High quality, low production copies of originals were the solution. After much research, Mike began manufacturing 15" globe lenses, ad glass and water transfer decals in 1989. Logos chosen for reproduction include some of the most interesting and colorful used by gasoline marketers on the west coast in the 1930's and '40's. The Gilmore Blu Green pump pictured here is an example of the results that can be achieved with our products.